Located in the Kensington and Chelsea district in London, a 6-minute walk from Natural History Museum London, South Kensington Flat with 3 beds, 2.5 baths has accommodations with an balcony and free WiFi. Guests staying at this apartment can use a fully equipped kitchen. The apartment has a satellite flat-screen TV, 3 bedrooms and a living room. Popular points of interest near the apartment include Victoria and Albert Museum, Royal Albert Hall and Harrods. The nearest airport is London City Airport, 11 miles from South Kensington Flat with 3 beds, 2.5 baths. 뀐 Located in the real heart of London, this property has an excellent location score of 8.3! 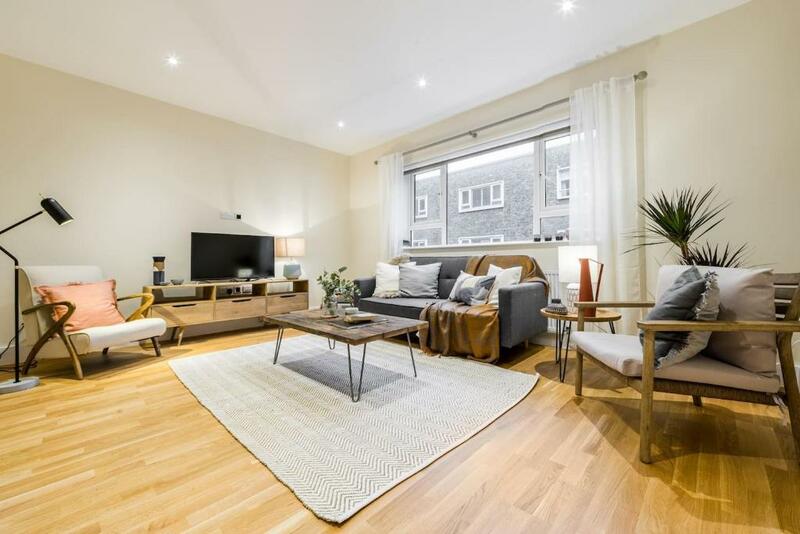 When would you like to stay at South Kensington Flat with 3 beds, 2.5 baths? This apartment has a microwave, kitchenware and sea view. House Rules South Kensington Flat with 3 beds, 2.5 baths takes special requests – add in the next step! South Kensington Flat with 3 beds, 2.5 baths accepts these cards and reserves the right to temporarily hold an amount prior to arrival. Please inform South Kensington Flat with 3 beds, 2.5 baths of your expected arrival time in advance. You can use the Special Requests box when booking, or contact the property directly using the contact details in your confirmation. Very clean and spacious, the apartment was great and me and my family enjoyed our trip thanks to Emily, one of the staff members that was really friendly and nice, the location was perfect since it had restaurants and shops near us and another thing is that the underground subway station was a 1 min walk from the apartment which was great. Some missing descriptions... On Bute street there are about 5 apartments that looks the same. We were staying on 18A. You can find them in AIRBNB but they are much cheaper in Booking.com (we were staying 6 nights for 260 Pound per night). Actually all of them are 3 floors apartments… The first 15 stairs lead to nice living room, well equipped kitchen, dining hall with small rear balcony and guest toilet. The next 15 stairs lead to 2 bedrooms and one bathroom. The last 15 stairs lead to master bedroom with bathroom. We were a family of 5 and our boys are not too young but it might be a problem to families with young kids or older people who has problem to climb up… Overall it was great… we got the keys earlier as we asked for, the location is perfect for attractions and dining and the apartment is well kept and designed. - We had a late checkin because the lady with the keys could just confirm 16:30 PM (even thought arrived 15:30 PM, but we were told about that only 15:00PM) - the Internet password was given incorrectly twice (by the lady who gave us the keys, and by the onwner via booking). The right password was told us when we were leaving by the cleaning lady. We had to by 3 SIM cards to have Internet during our stay. - The washer machine have a problem closing the door, and that was not told us. To not damage it, we didn't forced too much, and just when leaving the cleaning lady showed us that we have to hit the door. We could not wash clothes during our stay! - Too many stairs in the apt! My daugher was with broken leg and it was a big problem for us walking down and up the 3 floors of the apt.